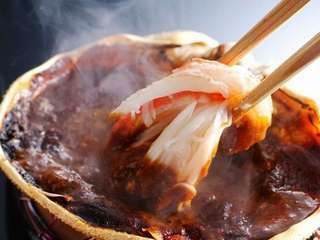 This plan is recommended for customers who want to try a variety of brand crab cuisine. 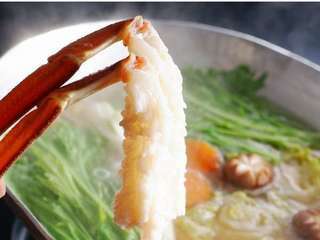 It features one and half portion of fresh brand local crab per person. 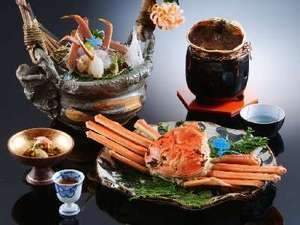 -Menu: Aperitif, Appetizer with crab miso, Crab sashimi, Grilled crab, Crab sushi, Crab hot pot, Boiled crab, Crab zosui(rice porridge after crab hot-pot), Pickled vegetables, Dessert. * Menu items are subject to change due to seasonal availability. 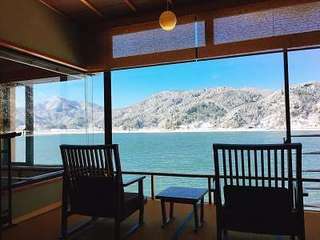 -The only room that we serve meals in guest room is "Japanese-Style Superior Room with River View. -Bath(hot spring): Large public bath open through the night. Two other baths(bamboo and wood bath tubs) are free for private use from 14:00~24:00, 6:00~11:00. -Designed color Yukata is free to lend. "Samue(room clothes)" are also available in the room as wearing in the inn. -Shuttle services are also provided from JR Kinosaki Onsen station(13:50~). Natural hot spring bath with bamboo bath tub for private use.